This article develops two key insights. First, copyrighted works are affected by two types of competitive forces: substitutive competition and Schumpeterian competition. Second, the relevant magnitude of each of these competitive forces changes at various points over the life cycle of copyrighted works. 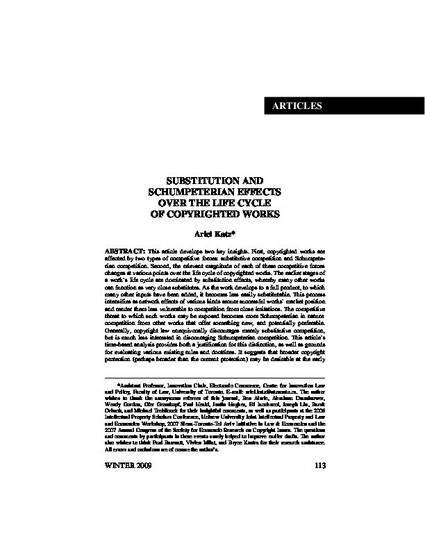 The earlier stages of a work's life cycle are dominated by substitution effects, whereby many other works can function as very close substitutes. As the work develops to a full product, to which many other inputs have been added, it becomes less easily substitutable. This process intensifies as network effects of various kinds secure successful works' market position and render them less vulnerable to competition from close imitations. The competitive threat to which such works may be exposed becomes more Schumpeterian in nature: competition from other works that offer something new, and potentially preferable. Generally, copyright law unequivocally discourages merely substitutive competition, but is much less interested in discouraging Schumpeterian competition. This article's time-based analysis provides both a justification for this distinction, as well as grounds for evaluating various existing rules and doctrines. It suggests that broader copyright protection (perhaps broader than the current protection) may be desirable at the early stages of works' life cycle, whereas narrower protection (perhaps narrower than the current) may be justified at later stages.